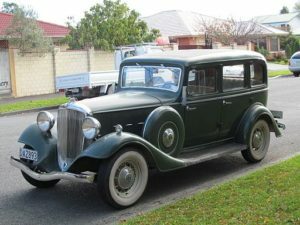 In the worst year of the Great Depression, when a gallon of gas and a can of Campbell’s soup both cost ten cents, the Hudson Motor Car Company introduced the 1933 Essex Terraplane Six and the Essex Terraplane Eight. With full, elegant fenders that swoop back into thick running boards, the ’33 Terraplane is described as the year and model of car the gangster, John Dillinger, preferred. N. A. C. C. Horsepower Rating—20.7 H.P. Clutch 1/3 pint 1/3 pint 180 c.c. Size 14 mm. Set points at exactly .025″ (.62 mm.). Replace after each 10,000 miles (16,000 kilometers) of service. Generator is regulated by position of third brush. This should only be altered by competent service stations using accurate measuring instruments. Output to be measured at generator. Do not exceed the above rates. Use only distilled water to cover plates. This should be done as frequently as found necessary. An average of every two weeks during the summer months (less frequently in cooler weather). Part of the reason Classic Cars Online US exists is to help connect classic car buyers and sellers, and we’ve added several ways for you to connect – pick your favorite, or join us in all four places: (1) sign up on the Classifieds page here on the site, (2) visit and like this site’s Facebook page, (3) the Best Classic Cars for Sale page or (4) join the Classic Cars Online: Classic Cars for Sale group if you are looking to buy or sell classic Hudsons.